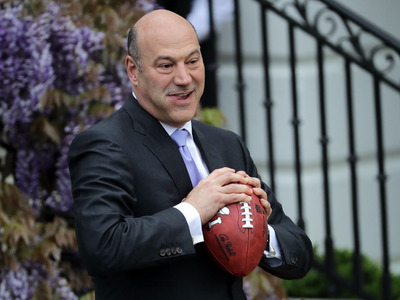 National Economic Council director and President Donald Trump’s top economic advisor, Gary Cohn, is the leading candidate to take over the top job at the Federal Reserve, according to a report from Politico. Politico’s Ben White and Victoria Guida said Tuesday that if Cohn wants the job currently occupied by Chair Janet Yellen, it’s his to take, according to four sources close to the replacement search. Cohn had been reportedly leading up the search for someone to take over for Yellen when her term expires in February 2018. Reports also suggested that Cohn may be interested in the job. Cohn, the former COO at Goldman Sachs, is currently helping to spearhead the White House’s efforts on tax reform and could pass on the Fed job if he feels that task is not completed, according to the report. As noted by Politico, Cohn would be the first non-economist Fed chair since the 1970s. The Trump administration announced its first nomination for the Fed’s Board of Governors on Monday. Randy Quarles was nominated to be vice chairman of supervision, a key role overseeing bank regulation.